Earlier this afternoon, First Lady Michelle Obama made an appearance at Riverside Elementary School in Alexandria, Virginia. At this appearance, the first lady discussed her new initiative to open 6,000 new salad bars in schools across the country within the next 3 years. 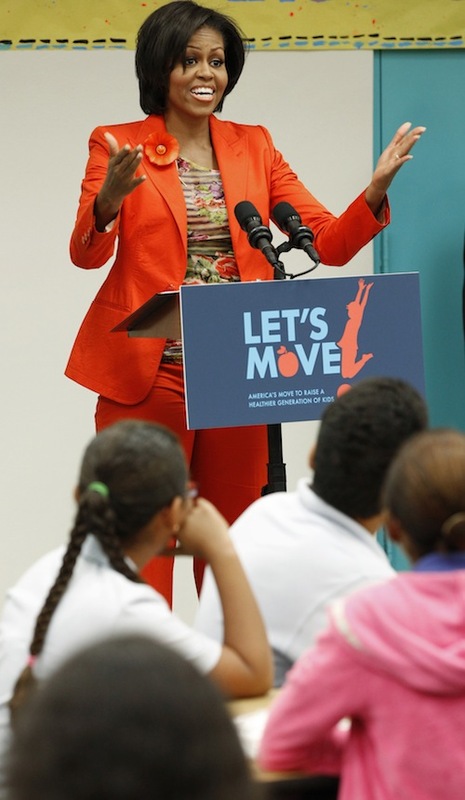 This initiative is part of Michelle’s “Let’s Move” campaign, promoting healthy nutrition and exercise for children. But, what did she wear to this event? 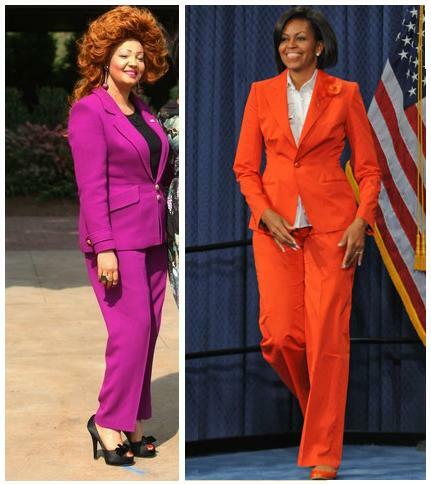 She brought out her orange pantsuit again! She paired this suit with a striped, tulle top, (available here) and a vintage, flower brooch. The blouse and suit were both designed by Jean Paul Gautier. What are your thoughts on this colorful ensemble? Last Wednesday, October 6th, President Barack Obama and First Lady Michelle Obama attended another Medal of Honor ceremony in the East Room of the White House. This ceremony honored the bravery and courage of Staff Sergeant Robert Miller, a soldier killed in Afghanistan in January of 2008. 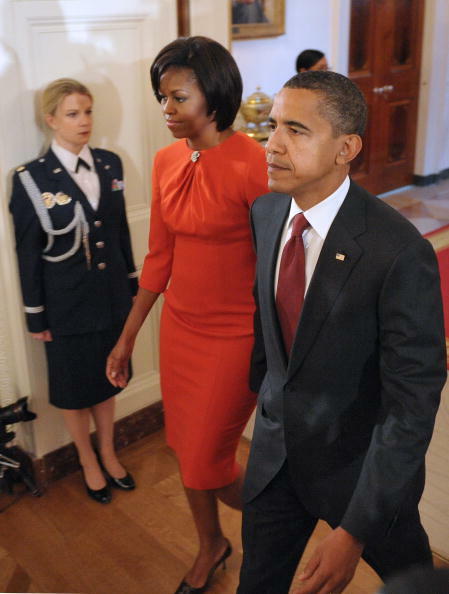 On this occasion, Michelle chose to wear a tomato colored sheath dressed designed by Maria Pinto. The intricate, inverted pleats at the neckline of this dress (very similar to this dress worn by Michelle last week) add weight to Mrs. Obama’s top half of her silhouette, evening out her figure, forming a gorgeous hourglass shape. I love the shape of this dress, and am even beginning to warm up to the color a little, however, why did Michelle feel the need to add this hideous brooch at the neckline of her ensemble? I think the dress would have been perfectly fine, and much more sophisticated without the pin. I cannot delight in the style of the dress, because my eyes are constantly being drawn to this hideous pin. It is just positioned in a very unusual and awkward place; it looks like it could strangle the first lady. Don’t get me wrong, I love brooches, but in my opinion, they belong on jackets and pinned at the shoulder. A new official White House photo of President Barack Obama and First Lady Michelle Obama has recently surfaced, picturing the couple with the Uruguay Minister of Foreign Affairs, Luis Almagro. This picture was taken last week at the United Nations General Assembly, located in New York City, at an event taking place at the Natural History Museum. 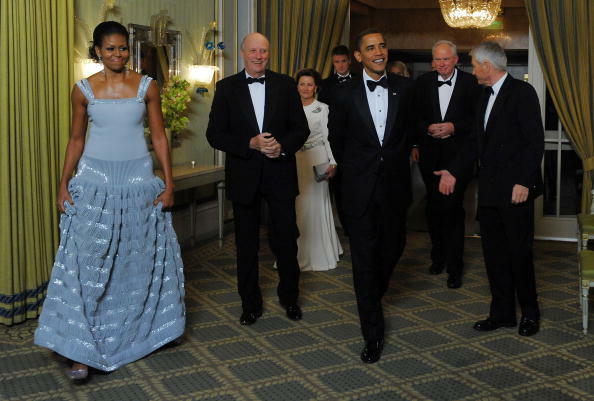 For his occasion, Michelle chose to wear a Alaia maple colored dress, rather similar to her hideous blue gown, also designed by Azzedine Alaia, worn last December to the Nobel Peace Prize gala in Oslo.. You would think that she would have learned not to wear this designer after the first fashion faux pas. The v-neckline and shorter, cocktail length do make this dress slightly less of an eye soar compared to the blue gown. 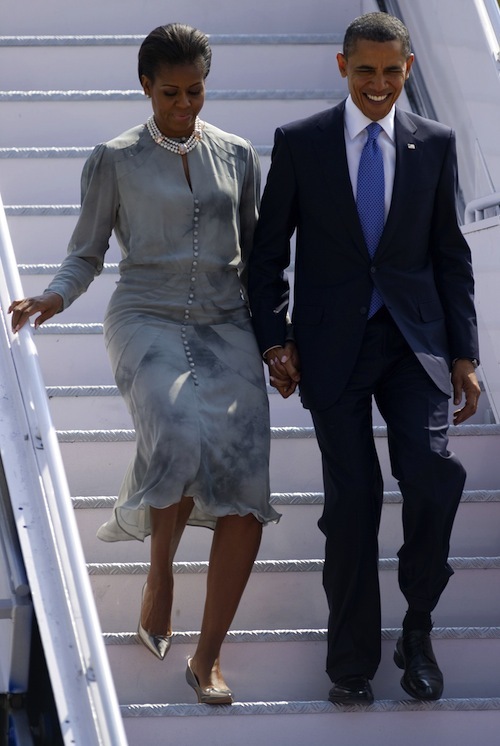 However, overall, come on, shouldn’t the first lady be dressing a little classier? The brooch pinned at the center of the neckline just makes this whole ensemble look cheap. Stylish Shine or Bright Bulge? Wednesday night, September 15th, President Barack Obama and First Lady Michelle Obama attended the Congressional Hispanic Caucus Institute’s 33rd Annual Awards Gala at the Washington Convention Center in Washington, D.C. President Obama not only attended, but also spoke at this event. Along with the first couple, other popular figures in the audience included Speaker of the House Nancy Pelosi (D-CA), Senate Majority Leader Harry Reid (D-NV), New York City Mayor Michael Bloomberg and actress Eva Longoria Parker. For this occasion, Michelle opted for a metallic look, one of this season’s hottest trends, according to Vogue. She strutted onto the stage in a bronze, sequin dress by one of her favorite designers, Moschino. This look was accentuated by her dazzling, round earrings and gold, peep-toe pumps. President Obama chose to keep his look classic, wearing a traditional double-button tuxedo. I’m a fan of President Obama’s classic double-button tux; this double-button jacket, popularized by Kennedy in the 1960’s, looks great on almost any man’s physique. However, what was Michelle thinking? This look might go over well on the runway, but not on Michelle’s pear silhouette. The shininess of this dress draws the viewers attention to bulges and problem areas that would otherwise go unnoticed. In my opinion, this dress could only be carried off by incredibly thin supermodels. Good try, Michelle! Maybe you’ll get it next time. However, this is just my opinion. How do you think Mrs. Obama looks? Fashionably correct?